in the Moon of the dark. and It is my Root. yet mad we are not. For our Spirits shine clear above the highest heights. Exquisite in beauty; it perceiveth naught but God. This is the bond which bindeth, be it but a glimmering. The works of His Art, made perfect for Himself. Unto Him who hath vouchsafed what transcendeth all price. for ye, none but ye, are the slaves of God. For ye are of God's Spirit that entered into Adam. Breath that Gabriel breathed into Mary. and trail ye the robes of the glory that is your due. 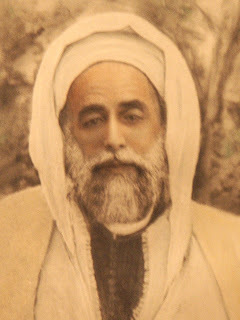 Referred as one of the most celebrated mystic saint of contemporary time Shaykh Ahmad al-Alawi (1869 - 14, July 1934), may God hallow his blessed face, master guide of 'Alawiya order and a Shadhili sufi in his line of transmission - is an unforgettable and extra-ordinary human being. He himself didn't feel doubt of his being a mujaddid (renewer, confirmer and proof of eternal faith) which the Holy Messenger Muhammad, upon him be benediction, had promised in every century. The previous before him unquestionably was the great Shaykh Ad-Darqawi himself, his lineage master. 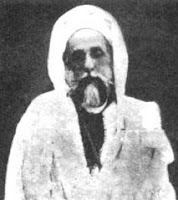 Shaikh Ahmad al-Alawi was born at Mostaganem, Algeria in 1869. His full name was Abul 'Abbas Ahmad ibn Mustafa al-Alawi. A little less than a year before his birth his mother Fatimah saw in her sleep the Prophet with a jonquil flower in his hand. He looked her full in the face and smiled at her and threw the flower to her, whereupon she took it up with humble modesty. When she woke, she told her husband of the vision, and he interpreted it as meaning that they would be blessed with a pious son, and he had in fact been importuning God not to leave him without an heir ... and after a few weeks God confirmed her dream, and she conceived her son. Shaykh al-Alawi's influence was pivotal to the spiritual development of many including that of westerns such as Thomas Merton, who looked to al-Alawi's writings and teachings in his own practice (see Fons Vitae's Merton and Sufism and post on Thomas Merton and Sufism). Also Shaykh's European followers include the French anarchist painter Gustave-Henri Jossot and the Swiss mystic and philosopher Frithjof Schuon. Many easterners and westerners alike, who have visited Shaykh Ahmad al-Alawi couldn't help but taken aback by the awe inspiring presence of his luminous being and at the same time many have shared a common experience that Shaykh al-Alawi resembles very much that of the appearance of Christ. If one to wonder how Christ would look like if he lived till his mature age, one has to look at some rare photograph of Shaykh al-Alawi and this resemblance that confirmed in the heart of many was confirmed in repeated spiritual visions and veridical dreams. Quoting from the Book, A Sufi Saint in the Twentieth Century: "The narrative which follows is by Dr Marcel Carret. It speaks for itself and needs no introduction; and having read it, the reader will no doubt understand why I have chosen to begin with it rather than with anything else, although at its outset the Shaikh is already fifty years old. ‘From my first contact with him I had the impression of being in the presence of no ordinary personality. The room I was shown into, like all rooms in Moslem houses, was without furniture. There were simply two chests which, as I found out later, were full of books and manuscripts. But the floor was covered from end to end with carpets and rush mats. In one corner was a rug-covered mattress, and here, with some cushions at his back, sitting straight upright, cross-legged, with his hands on his knees, was the Shaikh, in a motionless hieratic attitude which seemed at the same time perfectly natural. ‘The first thing that struck me was his likeness to the usual representations of Christ. His clothes, so nearly if not exactly the same as those which Jesus must have worn, the fine lawn head-cloth which framed his face, his whole attitude - everything conspired to reinforce the likeness. It occurred to me that such must have been the appearance of Christ when he received his disciples at the time when he was staying with Martha and Mary." One student of the path shared a vision he had where he saw the moon cloven in two. Then a plank was let down from it on chains, nearer and nearer the earth until it was only a little above us and we could see on it the Master al-Alawi - may God be pleased with him! and beside him is Sayyidna Isa (our Liege-Lord Jesus) - on him be Peace! Then a crier stood up and cried out: "Whoever wishes to see Jesus - on him be Peace! with the Supreme Master, they are both here, descended from Heaven, so let him come with all speed." Then the earth trembled and shook and all upon it were shaken, and all the people gathered together and asked to mount up beside the Master on that plank, but he said, "Stay where you are, and we will come back to you." I had a vision in which I was in the valley of the town of Tlemcen, and it was filled with a large crowd of people who were waiting for the descent from Heaven of Jesus - on him be Peace! and then a man descended and the people said: 'This is Jesus', and when I was able to see his face I found that he was the Shaikh Sidi Ahmad Bin Aliwah - may God be pleased with him. Another similar comparable vision was recounted by the great grandson of the founder of the Darqawi tariqah as well. 'Whilst I was absorbed in the invocation of the Supreme Name I saw the letters of Majesty fill the whole universe, and out of them shone the Prophet himself in a luminous form - may God whlem him in Glory and give him Peace! Then the letters manifested themselves in another shape, and I saw in them the face of Shaikh Sidi Ahmad Bin Aliwayh, and on it was written Mustafa Ahmad Bin Aliwah. Then I heard a voice say: "Witnesses! Observers!" Then the letters were manifested a third time, in the image of the Shaikh with a crown on his head, and while we looked a bird alighted on his head and spoke to me, saying: "Behold, this is the station (maqam) of Jesus - Peace be on him!" "The Gnostics are ranged in hierarchy: the knower of his Lord and the knower of himself; the knower of himself is stronger in Gnosis than the knower of his Lord. The veiled are ranged in hierarchy: the veiled from his Lord, and the veiled from himself. And the veiled from himself is more heavily veiled than the veiled from his Lord. Neither abandon thy soul, nor oppose it, but go along with it and search it for what is in it. Whoso hath known God in his soul returneth unto it and seeketh to gratify its longings." - Gnostic sayings of Shaykh Ahmad al-Alawi, al Fatiha to his blessed soul.